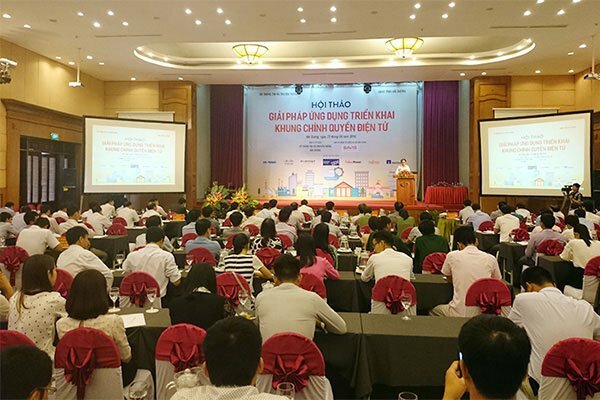 On the morning of June 23rd, 2016, Hai Duong Department of Information and Communications in collaboration with SAVIS Vietnam Corporation had organized a conference “Solution for the deployment of e-government framework” under the patronization of the Ministry of Information and Communications and People’s Committee of Hai Duong province. Participants of the conference comprised Mr. Le Manh Ha – Deputy Chairman of the Government Office, General Secretary of the National Committee on IT applications, Mr. Luong Van Cau, Vice Chairman of Hai Duong People’s Committee, along with numerous representatives of several Ministries, Departments of Information and Communications and top leading enterprises in Vietnam. Recently, e-government becomed an inevitable trend which being deployed intensively in many countries. The Ministry of Information and Communications promulgated a Vietnam e-government framework version 1.0 which is applied for Ministries/Departments, provinces and cities across the country. However, the practical implementation has been facing a great deal of challenges, especially in local because the current Framework was just the general pattern, some of technical criteria for connection and sharing service remain unclear. At the conference, Mr Le Manh Ha – Deputy Chairman of the Government Office, General Secretary of National Committee on IT application, praised Hai Duong Department of Information and Communications as the organizing committee. The conference has shown practical and essential issues of deploying e-government framework. The government issued the Resolution 36a /NQ-CP on e-government and specific tasks, targets for ministries/sectors and provinces/cities … For Hai Duong province, implementing the Resolution 36a/NQ-CP on e-government required following missions: Allocating sufficient IT budgets; Linking document management software from province level to commune level; Providing public services integrated with the e-Government portal; Linking public reporting system for processing dossiers in province. Mr. Le Manh Ha also suggested that promoting the settlement of online registration would help improve the transparency in state agencies. “Besides, Hai Duong e-Portal should open the business supporting module on the portal; reinforce the online queries via e- Portal to serve residents bette”, Mr. Le Manh Ha also explained some contents of the Resolution 36A for the participants at the conference. The conference has introduced solutions to meet the requirements of connecting national information systems, centralized management and connecting e-government services through Enterprise Service Bus (ESB) development solution. ESB provides thorough integrated link of e-government applications and services, and synchronization of data center infrastructure, information security, standard e-government structure for all provinces. At the conference, the representatives of Hai Duong Department of Information and Communications presented: Results of deploying e-government; Some enterprises presented: Architecture solution integrated e-government deployment services; ESB for public service providing model; Application-oriented infrastructure for data center; Source solutions for the data center; Security solutions for centralized data center… The target of implementing e-government framework in Hai Duong is to complete and improve the efficiency of e-government application, overcome difficulties in management & operation, that promises the innovation in government management of Hai Duong province particularly and of Vietnam generally. Next post From an office staff to a chef !